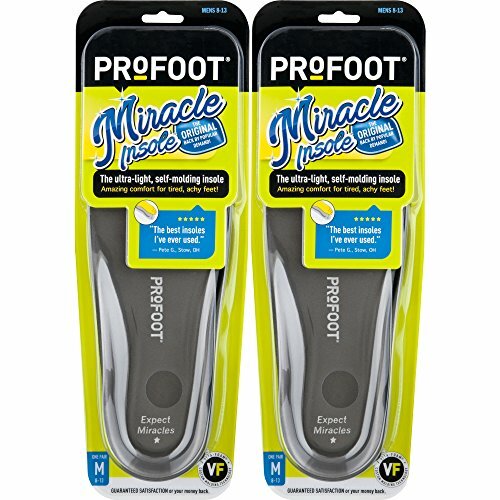 PROFOOT Original Miracle Insole, Men's 8-13, 2 Pair, 2-Layer Lightweight Insole with Memory-Foam Technology for Relief from Sore Feet and Aching Heels from Walking, Standing, Hiking by Profoot at Helix Alumni. Hurry! Limited time offer. Offer valid only while supplies last. Bringing back a classic that fills a specific need is a win-win for the consumer. Most shoes provide little to no support or cushioning of any kind. Bringing back a classic that fills a specific need is a win-win for the consumer. Most shoes provide little to no support or cushioning of any kind. The Original Miracle Insole is a high quality insole with tremendous customer loyalty and satisfaction. Backed by PROFOOT's Satisfaction Guarantee, the lightweight foam of these insoles mold to your foot and feature both heel cup and arch support where other cushions or flat insoles offer NO support. Experience a new standard of foot support with PROFOOT! Available for both Men and Women. DISCOVER THE MIRACLE: You don't have "problem feet" you just haven't discovered the PROFOOT 2oz. Miracle insole yet. Its unique 2-layer design molds exactly to the shape of your feet to ease pain from walking, running, hiking, or standing. Ultra Light. FITS LIKE A GLOVE: With its unique 2-layer design the Miracle insole adapts to the shape of your foot! Get the all day relief your feet deserve with the soothing cushion of Miracle insoles, great for sneakers, boots, flats, sandals, or heels. Cut to fit. SHOCK ABSORBING: The bottom layer of ProFoot Miracle insole is a shock absorber that lifts your arch & stabilizes your heel, cushioning the impact from walking or running that can cause aching knees, shins or hips. Soothing relief right where it hurts. FOUNDED IN 1986 by a chiropractor who listened to his patients' complaints about pain solution products; inspired by their feedback, he developed a range of footcare foot care products, like heel insoles & arch support inserts, that addressed their issues. PROFOOT is a family-owned footcare business based right here in Brooklyn, NY. We're part of one of the most pedestrian cities in the world with millions of feet hitting the pavement every day. Our motto: "The better your feet feel, the more you can do!"